The Talakhaya Watershed, located on the southern portion of Rota, is 1,100 acres of steep limestone cliffs and terraces, vegetated with native limestone forest and grassy savannahs. Streams flow through the watershed almost year round, and the caves and springs supply all domestic water on Rota. The coral reef below the watershed is a popular fishing area. Throughout the years, deer hunters have set fires to the grasses, an illegal tactic to draw deer out into the open. The result is large areas of barren, exposed soils that quickly erode into the ocean, creating sediment plumes that smother coral reefs. 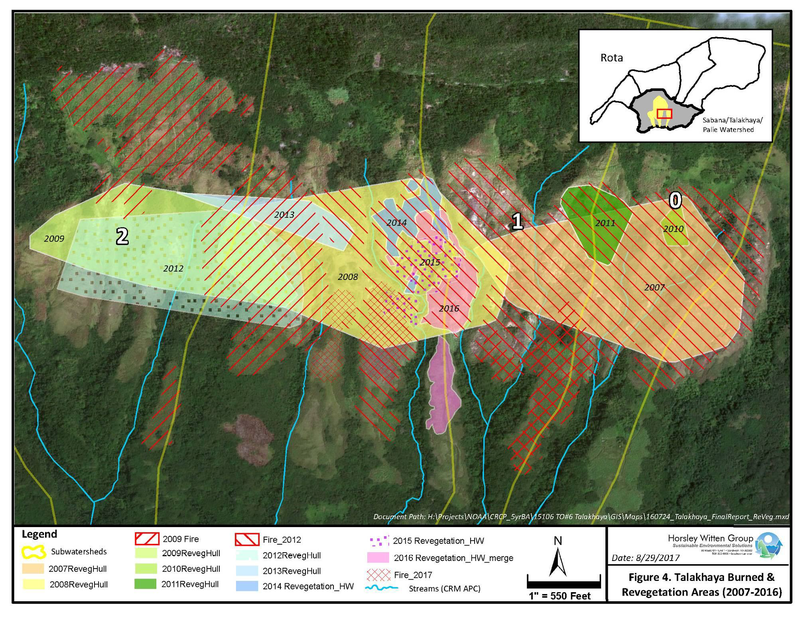 Due to deforestation and soil loss, as well as the importance of adjacent coral reefs, Talakhaya was identified as a priority watershed in 2005. The Talakhaya Revegetation Project began in 2007 and grew into a monumental effort to restore ecosystem health in the watershed. For over a decade, the Bureau of Environmental and Coastal Quality (BECQ) and Rota Department of Lands and Natural Resources (DLNR) – Forestry have worked together with local volunteers and federal partners to revitalize the ecosystem for the benefit of both nature and the community. Thanks to the strong work of dedicated volunteers, Talakhaya has become an international example of how upland restoration can improve coral reef health in the receiving waters below. Ten years since the start of the revegetation project, volunteers are still working hard to replant the soils that are exposed by intentional burning. 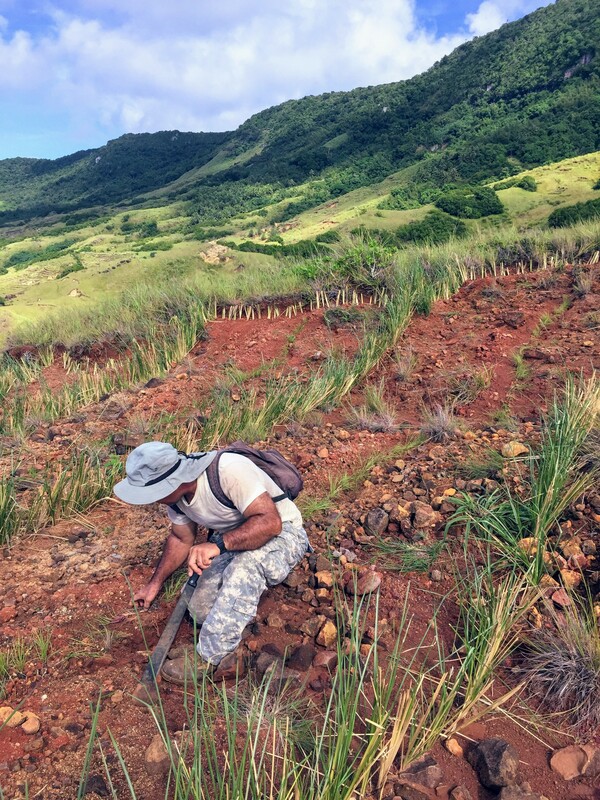 Volunteers work during the summer rainy season to dig holes in the hard rock, where they plant Vetiver grasses with good roots that hold the soil in place. They also create rock barriers to slow down rainwater and keep it from causing more erosion as it flows toward the ocean. As healthy soil accumulates, volunteers also plant native trees that will ultimately spread into native forest, providing habitat for birds and other wildlife. In the dry season, Field Surveillance agents watch over the land and monitor public use to help prevent fires that can ruin years of hard work. The “No Burn” Campaign has been providing educational materials to residents about the importance of the Talakhaya Watershed and the extensive damage caused by burning. These efforts have drastically reduced the number and severity of fires in the conservation area. Monitoring and evaluation is key to adapting management so that we continue to invest in actions that have a positive impact on ecosystems and communities. In recent years, managers have strengthened efforts to track and evaluate impacts. It is challenging to measure change in this case, due to a lack of robust data from before and during the early stages of the project. However, preliminary results from a stream monitoring and soil loss assessment provide a baseline and recommendations for improved monitoring technique. In coming years, improved geospatial data (like the map below, showing area planted and area affected by large burns) will also help track and visualize progress in the area. For more information about conservation priorities and activities taking place in Talakhaya, please view the entire Talakhaya Conservation Action Plan here. CHECK OUT this video (image below is a link to the YouTube video) of the intrepid Rota Forestry staff and volunteers planting vetiver grass for the Talakhaya Revegetation Project. Keep in mind that everyone in this video is wearing 40-50 pound bags of grass and dirt on their backs! The large eroded area on the left at the beginning of the video shows an exposed cliff that collapsed during the tropical storm that passed Rota a week before the video was shot. The pathway in the foreground on the right is about 12″ wide with a 30 ft. drop to the left. Thanks to all of our volunteers and colleagues for their hard work protecting our environment and for staying safe during the 10 weeks of planting this year!